MusicaManila Recording and alcalaniloMUSIC bring you wonderful news as composer/arranger/singer Nilo Alcala has been invited to Korea by the Ministry of Culture, Sports, and Tourism to attend a music workshop. Appointed by the Cultural Center of the Philippines, Alcala will represent the Philippines in a convention of composers from 11 different Asian countries , August 12 to 23, 2012. 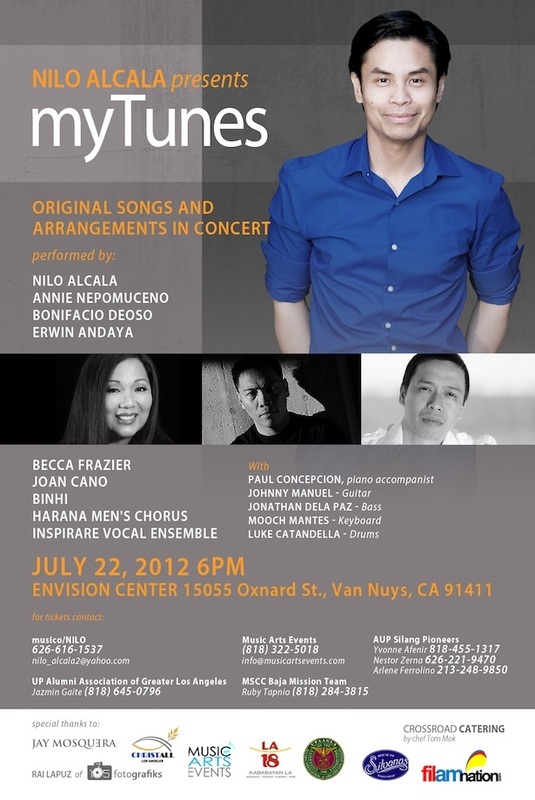 To support the upcoming trip of Alcala, musical personalities in Los Angeles gather in a special one night concert dubbed as "Nilo Alcala presents myTunes" on July 22, 2012, 6pm at the ENVision Center in Van Nuys, CA. Also in support of this is a CD ALBUM to be launched also on July 22, 2012 at the concert. The "Dare to Dream" CD ALBUM features the inspirational vocal music of singer/songwriter Nilo Alcala, with special guest vocalists Annie Nepomuceno and Erwin Andaya! ORDER NOW YOUR TICKETS TO myTUNES CONCERT! Tickets will be reserved for you and will be available for pick-up at the venue. The "myTunes" concert supports projects of ChristAll, Inc - a non-profit 501(c)(3) organization in Los Angeles. One of its programs is ECONSERVE which aims to equip out-of-school youths in environmental conservation located in the Nauhan Lake community (south of Manila, Philippines). Revenues from the concert souvenir program will directly benefit this ChristAll, Inc project.